A&A is your ultimate source for canopy and tent rentals in Alexandria, NOVA, and the Washington DC metro area. We offer a variety of easy to set up tents so you can shelter your guests from the rain & sun at your next event. Available in several sizes, we have a tent for every occasion. This is a self setup pole Tent and has to be set up on grass. 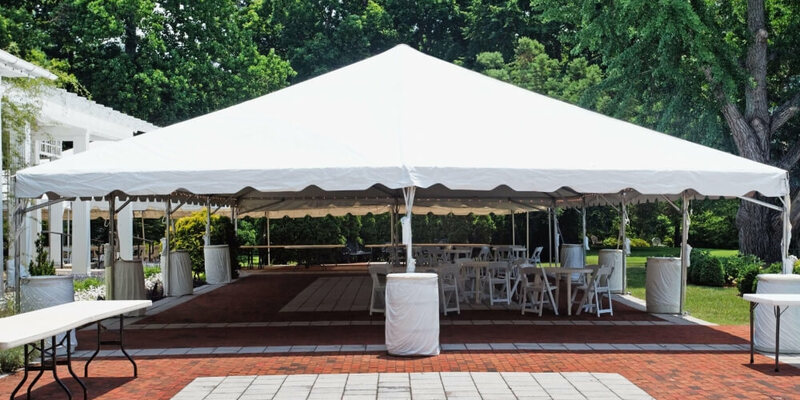 A&A also offers a selection of frame tents, perfect for larger events. These tents will be set up by our tent crew as they require specialized knowledge to assemble. Our frame tents are available in several sizes to accommodate your party size and location. Sidewalls can be added for protection from the elements while lighting and tent heaters and fans can be added to provide a comfortable environment. If you’re interested in renting a frame tent please give us a call so our tent coordinator can assist you in determining the appropriate size tent for your event. Prior to your event our team will conduct a site survey at your location to determine the correct tent size and the price. There is no charge for this service. After the site survey is completed, we will provide you with the price for the tent rental and delivery fee. Please call well in advance of your event so we can set up a mutually convenient time for our site survey. Propane tanks available at additional cost. Please call for prices & sizes.